1Beykent University, Faculty of Economics and Administrative Sciences, Ayazaga 34396 Maslak-Istanbul, Turkey. *To whom correspondence should be addressed. E-mail: turgutozkan@beykent.edu.tr. Received 19 September, 2017; Received in revised form 16 October, 2017; Accepted 19 October, 2017. Quanto option, Weather Risk Management, Black-Scholes, Cooling degree days. Weather risk management can be described as all financial activities that are geared towards keeping the income flow deviations, which the weather conditions will create, in stability band by using preventive financial tools. Like other financial derivatives, weather derivatives have special quality types that consist of weather related securities such as floor, cap, collar, swap, Quanto option besides conventional types like forward, option, futures. 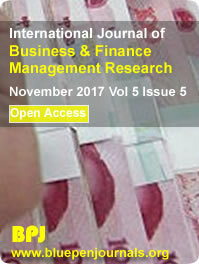 In this study, implementation of Black-Scholes option pricing model, which is used in pricing of options, on weather risk management and especially weather risk options is specified. It is concluded that, the model can be used for effective weather risk management as well.